Ahhh Michael Mann.. First off, I am a fan..have been for ages, so many good movies & fashion statements in your TV & film work ~ and “Blackhat” is not the massive fiasco that it could be but it’s hard to know where to begin analyzing it. First off there’s the screenplay by Morgan Davis Foehl, which alternates between dull, rushed and an utter disregard for reasonable logic at times. But let’s not rush ahead of ourselves here with all that. 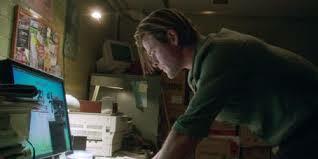 Chris Hemsworth stars as “Nicholas Hathaway”, the world’s greatest computer hacker who also happens to look a lot like Thor (thankfully). Currently serving 15 years for cyber-crimes, he gets furloughed from jail at the behest of his old MIT roommate “Lien Chen” (Leehom Wang) who is now a big-time higher-up in the Chinese military. Chen is working with FBI agent “Carol Barrett” (Viola Davis) to track down a hacker who put the whammy on both an Asian nuclear reactor and the American commodities exchange using malware code created by Hathaway & Chen in their college days. 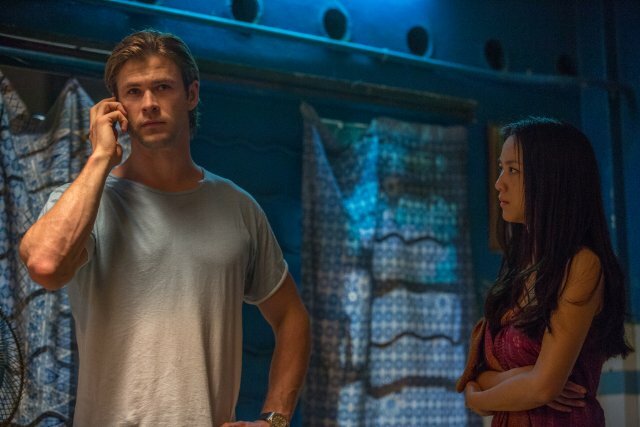 The pursuit of the villain takes our team — which includes Chen’s sister “Lien” (Wei Tang), who falls in love with Hathaway in one of the most random, chemistry-free onscreen romances in recent memory — to Los Angeles, Hong Kong, Malaysia and Indonesia, but in all this globe-trotting studio money can buy, it’s no substitute for things little things like oh..character development, suspense and motivation. Hathaway’s character concept is lacking, and he’s one of the film’s better-written roles, and it seems only Davis can make filet mignon out of the ground beef of this material, turning vague and clunky dialogue into gold with just one or two quick quips and a sardonic glance over her sunglasses. 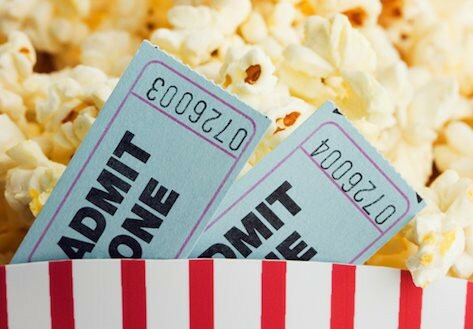 The screenplay, mocks us at times, with the fact that we are not supposed to take notice the bad guys’ inability to hit with directly aimed bullets, key characters – aka “The Good Guys” -despite constant flutters of automatic weapons fire, or the fact that an FBI agent asks another a personal question based on a phone call to which he was not privy to, or one of my favourite aspects, the fact that blond, six-and-a-half-foot Hemsworth is supposed to blend in with the crowds in Asia like he’s not head & shoulders above them all..literally..and attracting no second glances whatsoever as he’s on the run in airports or sneaking into computer facilities or engaging in gun battles in the middle of crowded street festivals. Lastly, that a computer hack with huge mayhem & destruction imminently pending, within a matter of hours to be precise, but curiously so, the lead characters have time to fall completely in love and plan a future relationship and as cyber-hackers they just pick up guns that they immediately know how to use truly made me shake my head as in ‘okey dokey then’. But to best describe what truly underscores the problems with some of the filming, which oddly enough looks at it’s worst whenever there’s some type of light source on screen, whether it be a lamp or a car headlight or just the sun; so where does the big finale happen? Well…amongst hundreds of people carrying torches, but of course (insert facetious sarcasm here). Because not only is it weird and completely off base, but that these guys are carrying huge automatic weapons and no one out of all these thousands of people notice it. NONE! Come on now. 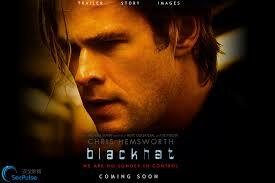 Given Sony’s recent ‘issues’ with hacking, the timing couldn’t be better for a movie about the vulnerability of international computer networks, but “Blackhat” isn’t that movie..though I’m not going to say it couldn’t be plausible, because despite what you might think, the actors are believable enough as their characters, it’s what the plot makes them do at times that isn’t. I’m thinking that pretty much no matter how you slice it, this is one hack-ity hacker pic that just hasn’t really cracked it’s own code of how to make a movie about computer espionage that doesn’t come down to scene after scene of people sitting at keyboards and making clicky-clack noises with their fingers. To his credit, Michael Mann does try to jazz things up with cool tracking shots through microchips (it’s like the express lane to Tron’s house) or even putting the camera inside a thumb-drive slot or under a keyboard that’s being typed upon, and though it has it’s entertaining moments for sure, in the end it’s to little avail in saving the film from some of the other things that make it a no go. “But let’s not rush ahead of ourselves…” Rush. Chris Hemsworth. Nice one. Nice review though I had no hopes for this one from the start. I too am a huge Michael Mann fan, but what happened? Good post! Thanks for Noticing!! whooohooooo!! I’m so glad someone caught my ‘Rush’ reference.. I happened to be watching Critics Choice Awards at the same time as writing this and Hemsworth got onstage to introduce Achievement award to Ron Howard & mentioned RUSH and I was like..huh.. perfect!! 😀 Yeah and what did happen to Michael Mann..damn it. Loved Heat and Collateral but he’s fallen down from there. So odd you mention Heat. Just re-watched that after many years..and was just WOWED all over again. Miss that kind of movie from him. Mind you, there are a few amazing scenes in this film that have you thinking back..sadly just not do-able as a whole film. Heat is one of my all time favs. Near perfect. I really wanted to like Miami Vice but it just didnt click. But still had some great moments. The strange thing is that I did not realize that Michael Mann had directed this film until recently. The trailers made it seem like another generic hacking film like Firewall. Though, judging by your review, it does not seem too far off from that. In Mann’s canon of films, would you rank this as the worst or simply in the bottom tier? Tough call Courtney.. sadly it’s def. in the bottom 2 ..maybe 3.